Chef Thomas Keller has changed the way that Americans think about fine food, and not since Julia Child has a single chef altered the landscape of dining in the United States. Many people will be surprised to learn that Thomas Keller has no formal culinary training. Instead, he learned to cook by doing, and after years of working hard in commercial kitchens, his career finally took off. 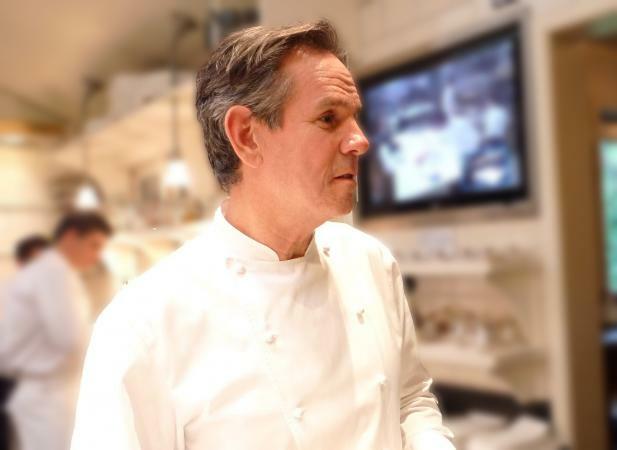 Thomas Keller was born on October 14, 1955. A California native, Keller began his culinary career as the dishwasher of a Palm Beach restaurant that was run by his mother. He quickly made his way up the ranks into the kitchen, where he discovered his passion for cooking. Early in his career, Keller met up with the world famous master chef, Roland Henin. Henin guided Keller through the process of mastering the culinary arts, teaching him that cooking well involved feeling, and not just technique. Keller cites Henin as his mentor and a large part of his success. After working with Henin, Keller went on to work at several Michelin-starred restaurants in Europe and the United States. His experience at these establishments formed the foundation of his signature cooking style. Chef Thomas Keller owns a series of restaurants, many of which are known for their fine dining environments. His first restaurant, "Rakal," garnered excellent reviews but fell prey to a lacking economy in the 1980s. Several years later he opened "The French Laundry" in Napa Valley, California, which has become one of the finest, most reputable restaurants in the United States. Reservations are often booked many months in advance, and dinner at the French Laundry can set add up to thousands of dollars. Bouchon - This somewhat more casual eatery is just down the street from the French Laundry in Yountville, California. There is also a Bouchon located in Las Vegas, within the Venetian hotel. Per Se - This fine establishment is located in the Time Warner Complex in New York City. Known for the quality of its food and service, it is difficult to get a reservation here. Ad Hoc - This additional Yountville restaurant is more family-style, though it still smacks of Thomas Keller's signature style of fine cooking. The Bouchon Bakery - With locations in both Yountville and New York, the Bouchon Bakery serves up the finest baked goods you'll find in either area. To endorse Keller's reputation for fine foods, the Michelin Guide has assigned several of his restaurants Michelin stars. Both the French Laundry and Per Se were assigned three stars, while Bouchon has one. For those not in the know, a Michelin star is one of the most renowned honors that can be bestowed upon a restaurant. Michelin stars are reserved for only the finest eating establishments, and these ratings are taken very seriously. The French Laundry Cookbook was Keller's first cookbook, showcasing the food from his first (and finest) restaurant, the French Laundry. With 150 recipes straight from the restaurant's kitchen, the French Laundry Cookbook is a must-have for discerning home chefs. Bouchon was released in 2004 and titled after Keller's second Yountville restaurant of the same name. Containing recipes for more casual fare than The French Laundry Cookbook, Bouchon still captures Keller's essence of fine dining. Under Pressure: Cooking Sous Vide is Keller's most original cookbook. Sous vide is the process of cooking food in a vacuum-sealed bag at very low temperatures. This technique allows for all-new flavor and texture experiences, since the food never comes in contact with a hot surface. Keller has pioneered this new culinary area and this book is the first of its kind. Ad Hoc at Home is Keller's fourth book, and includes recipes from his Ad Hoc restaurant in Yountville. Geared more towards large, casual meals, this cookbook is sure to please a crowd.